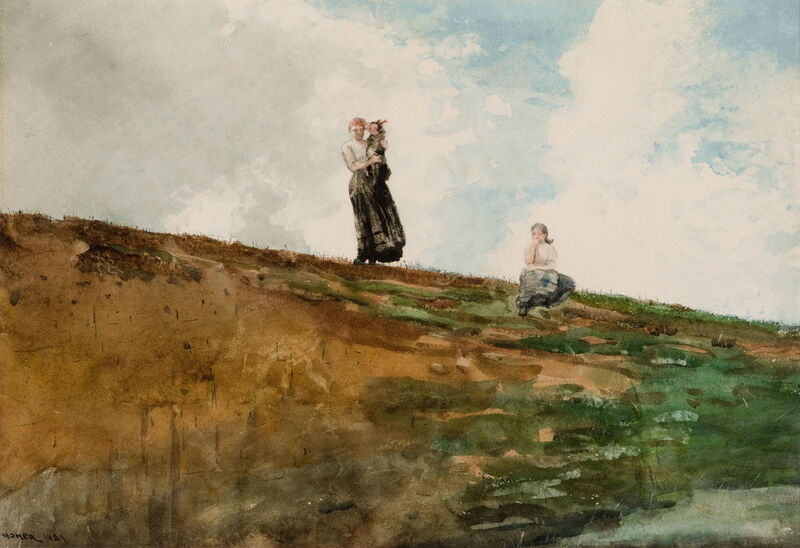 Winslow Homer had visited England primarily to study the watercolours of JMW Turner, and to understand his colour theories and their implementation. By mid March 1881, he had completed that phase, and now needed to go somewhere to paint in seclusion, to put what he had learned into practice. 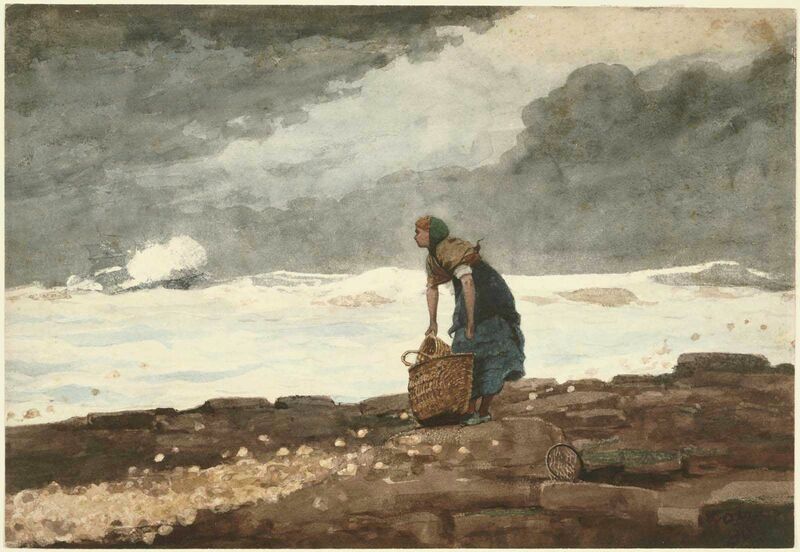 He had seen some of the illustrations of JD Watson showing the distant fishing community of Cullercoats, and – as much by chance as by design – travelled there in late March 1881. He then spent until early November 1882 painting the fishermen and their fishlasses or fishwives. Life in Cullercoats, like that in the hundreds of similar fishing communities around the coast of Britain at the time, had a natural rhythm. When the conditions were favourable, the men and boys would take their small open boats, cobles, out to sea to fish. Once they had a full catch, or the weather forced them back, they returned, to the relief of the women and their families. 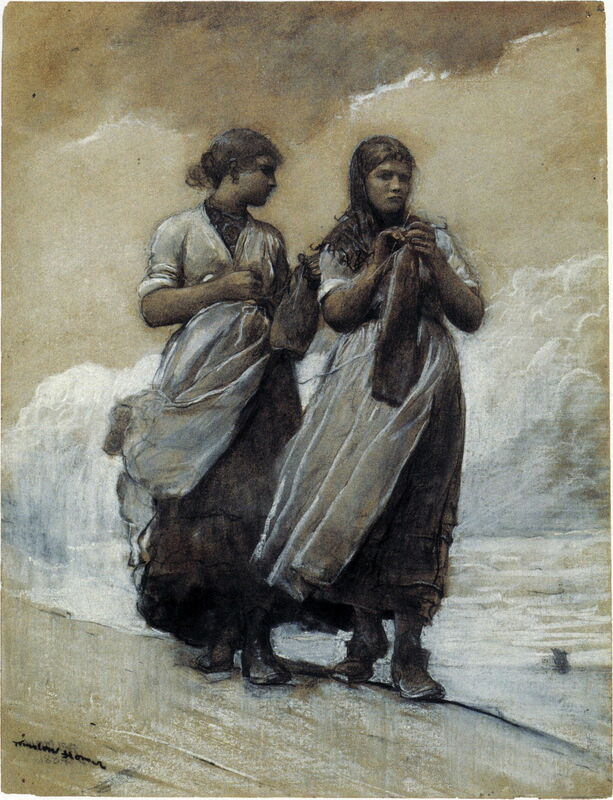 Winslow Homer (1836–1910), Fisher Girls on Shore, Tynemouth (1884), charcoal and chalk on paper, 58.4 × 44.1 cm, Wadsworth Atheneum, Hartford, CT. Wikimedia Commons. When their men were away, the fishlasses and fishwives would continue with their supporting tasks of knitting and repairing clothing, repairing nets and gear, but that workload was relatively light. Their constant thoughts were with their men, and when they would return. In the days before radio, the only way in which they could know when the boats were coming back was to watch for them. 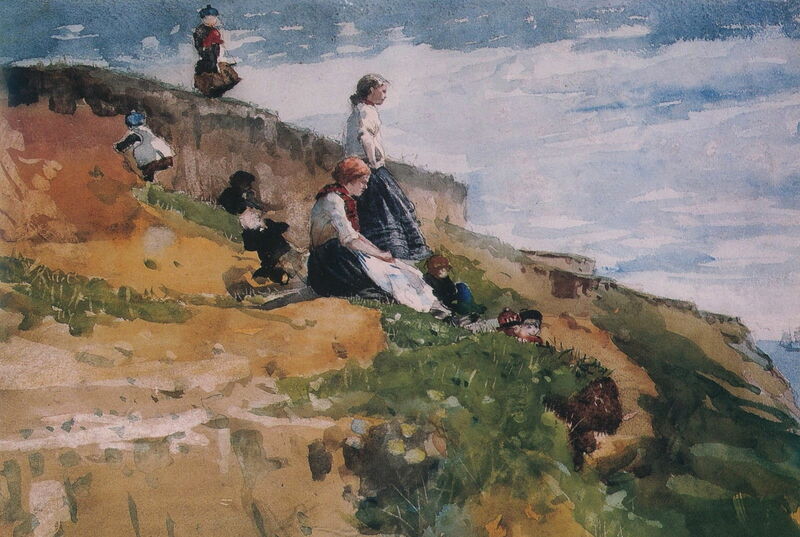 Winslow Homer (1836–1910), Watching from the Cliffs (1881), watercolor on medium weight white watercolor paper, 34.8 × 49.5 cm, Reynolda House Museum of American Art, Winston-Salem, NC. Wikimedia Commons. In the summer, and in fine weather, watching from the tops of the low cliffs around Cullercoats was a pleasant pastime for the children. 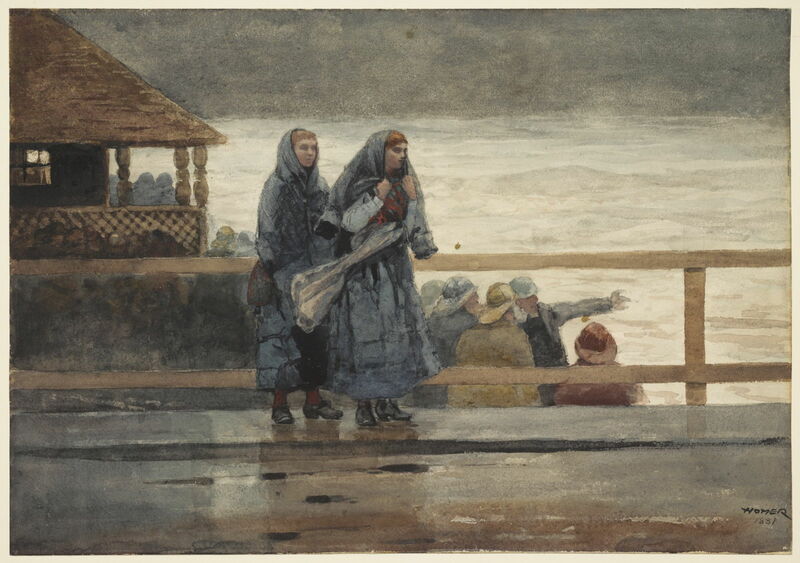 Winslow Homer (1836–1910), Fisherman’s Family (The Lookout) (1881), watercolor over pencil on paper, 34.2 × 49.2 cm, Museum of Fine Arts, Boston, MA. Wikimedia Commons. The women took turns to act as lookout, who had to keep a close watch on the horizon. 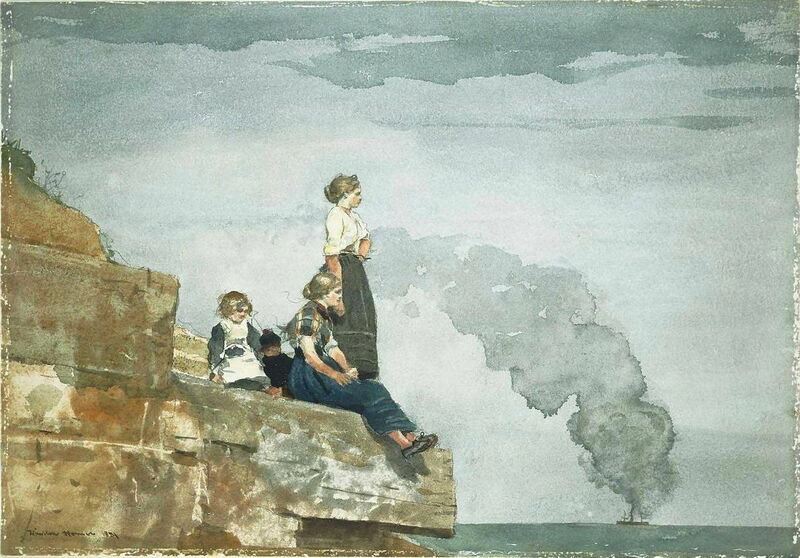 In his Fisherman’s Family (The Lookout) (1881), Homer also shows the smoke rising from a steamship on the horizon. Watching was not just the task of the lookout. The women and younger children spent a lot of their time watching and waiting, taking shelter at the foot of the cliffs when there was a cool wind blowing. 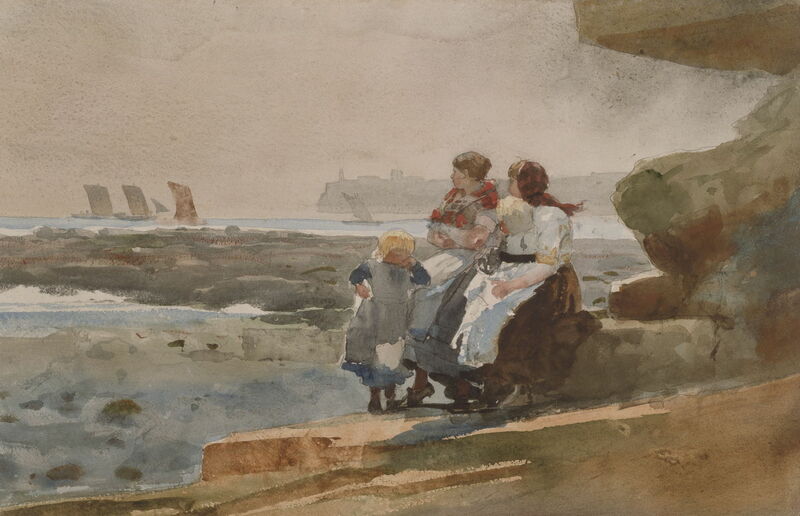 Winslow Homer (1836–1910), Under the Cliff, Cullercoats (c 1881), watercolor and graphite on paper, 31.59 × 49.37 cm, Addison Gallery of American Art, Andover, MA. Wikimedia Commons. Watching was recognised as being such an important task that the Coastguard started to pay lookouts and providing them with telescopes. That work was often undertaken by older men who could no longer go to sea. 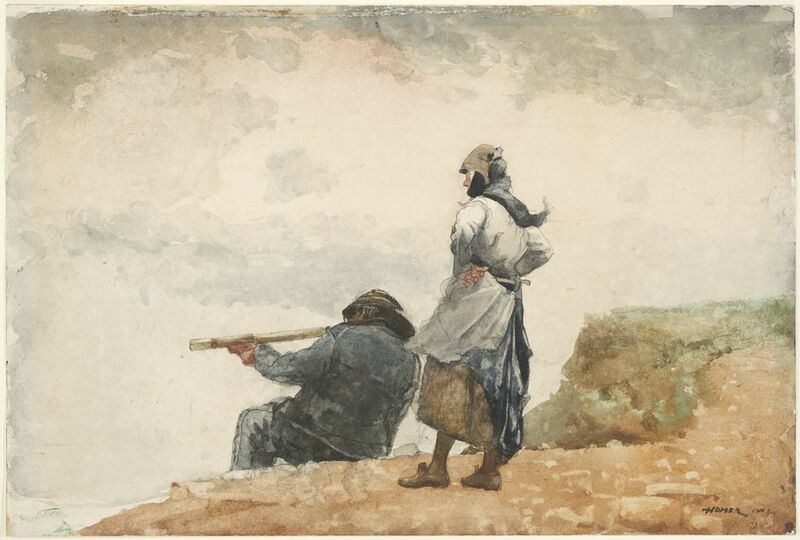 Winslow Homer (1836–1910), The Lookout (1882), watercolor over graphite on wove paper, 37.2 × 55.6 cm, Fogg Museum, Cambridge, MA. Wikimedia Commons. When the weather was deteriorating, the watching became more important, and increasingly anxious. There was always the hope that the boats would return before the wind and waves got up. Once the boats started to return to harbour, each fishwife had to watch for the return of those carrying her husband, sons, and relatives. 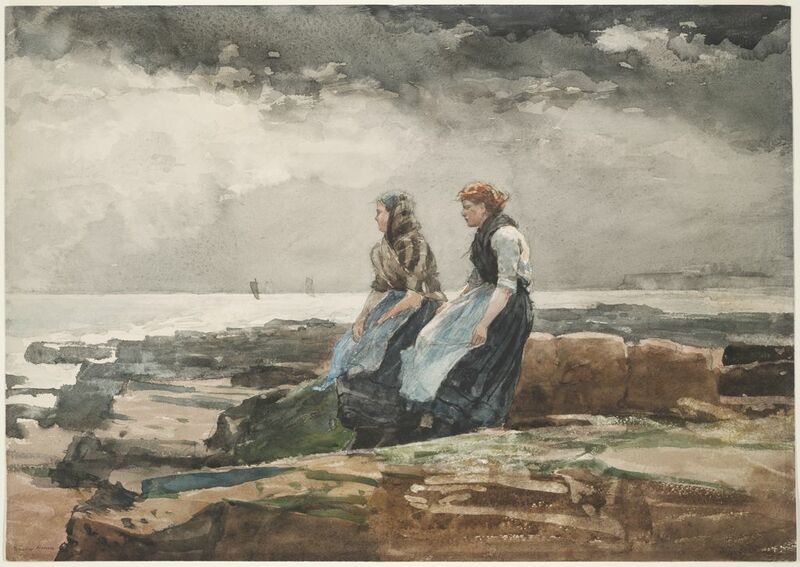 Winslow Homer (1836–1910), The Watcher, Tynemouth (1882), transparent and opaque watercolor, with rewetting, blotting, and scraping, heightened with gum glaze, over graphite, on moderately thick, slightly textured, cream wove paper (all edges trimmed), 21.3 × 37.7 cm, Art Institute of Chicago, Chicago, IL. Wikimedia Commons. Storms were inevitably the biggest fear. Even though the loss of whole boats was mercifully very unusual, severe weather often took individual members of crew. It also made accidents more common, and the resulting injuries could stop a man from going to sea, leaving his family destitute and starving. 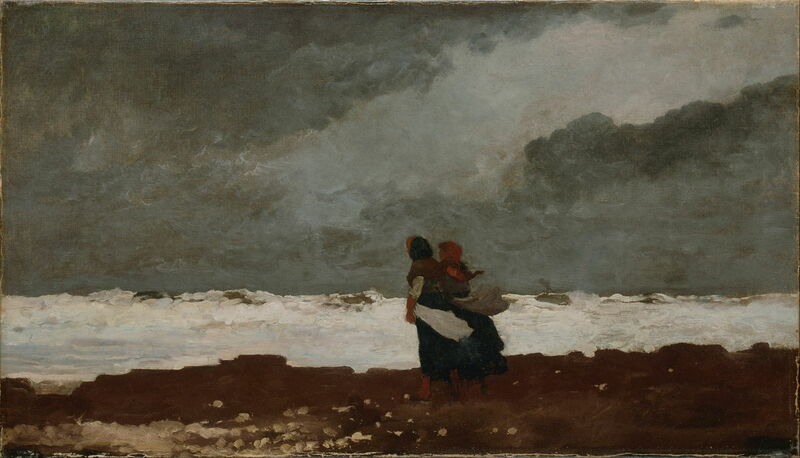 Winslow Homer (1836–1910), Two Figures by the Sea (1882), oil on canvas, 48.9 × 87.3 cm, Denver Art Museum, Denver, CO. Wikimedia Commons. 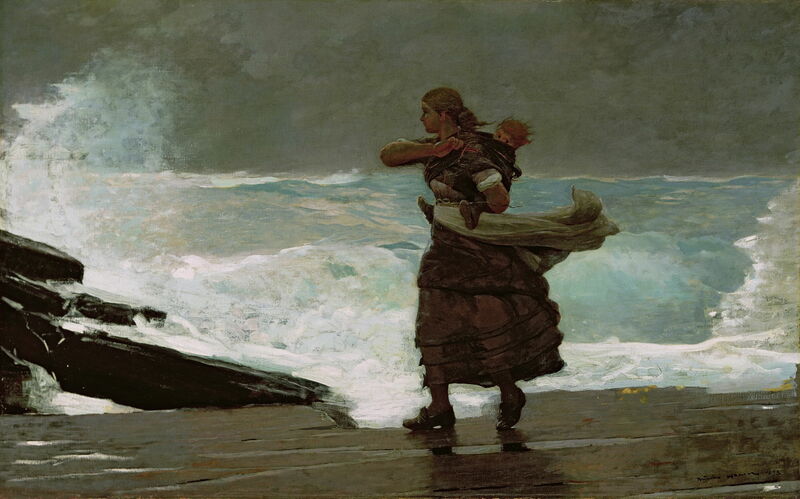 Homer’s many paintings of women watching for the safe return of their men go deeper too. We become the watchers, looking for that next hope in our lives, hoping that we will weather the storm and come home safely. Although titled Girl with Red Stockings, this fishwife has put her empty baskets down to look at a ship being wrecked in front of her, to the left of the painting. The ship still has all its sails set, and appears to be in the process of being driven ashore in an easterly gale. Such shipwrecks were not uncommon, particularly among sailing vessels, which were at the mercy of the wind. Once driven inshore by an easterly wind and sea, there was little that the crew could do to avoid running aground, and their ship breaking up. Homer’s Watching the Tempest shows the men in the process of preparing to launch the lifeboat. A large crowd has gathered along the top of the cliff on the left of the painting. 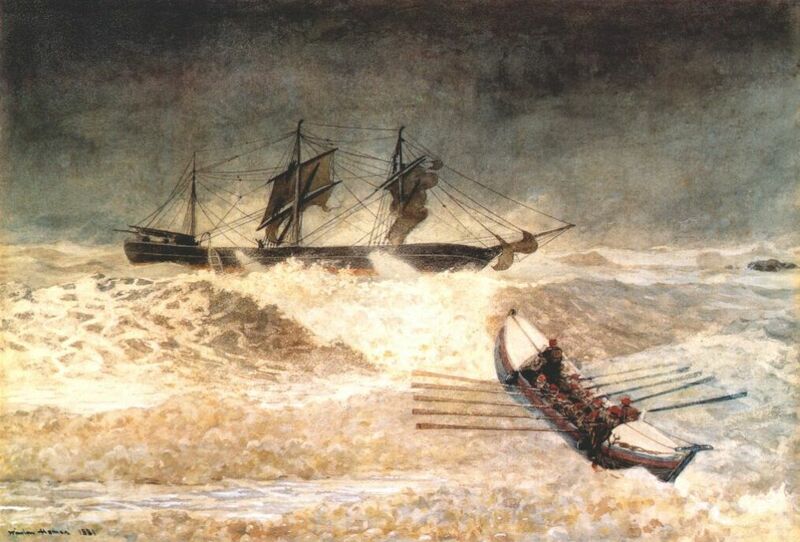 This may have been painted in response to a real-life wreck which Homer witnessed at Cullercoats. In the early morning of 21 October 1881, the 1000 ton barque, the Iron Crown, was driven aground in a storm. In the next hours, the ship’s crew were rescued, following which the derelict broke up. 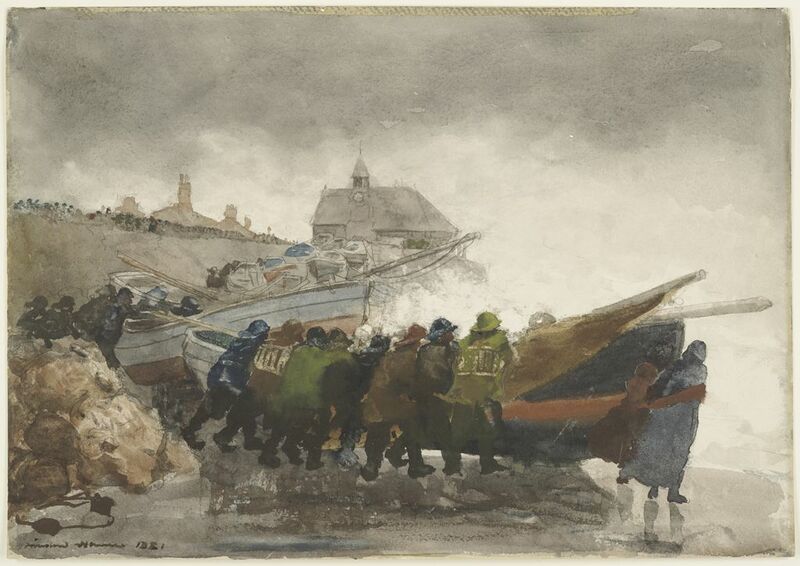 Homer later painted a watercolour showing the rescue, probably constructed from sketches, witness accounts, and photographs. The moment which he shows is the second and final pass of the lifeboat, required to rescue the last member of the crew on board. 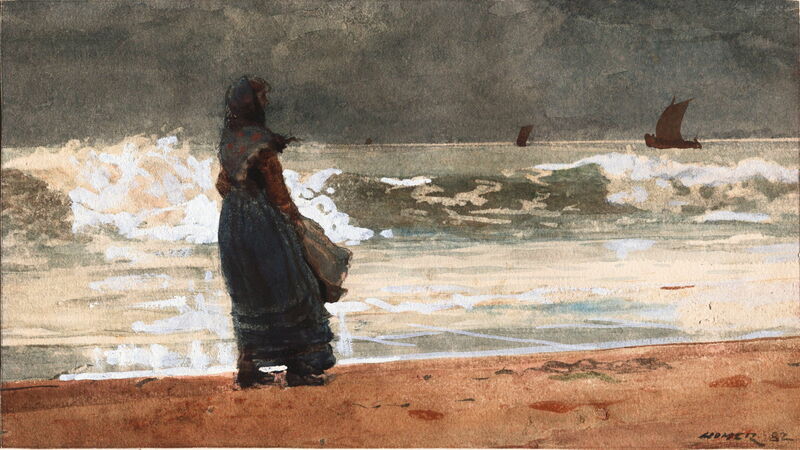 Winslow Homer (1836–1910), Wreck of the Iron Crown (1881), watercolor on paper, 51.4 × 74.6 cm, Baltimore Museum of Art, Baltimore, MD. WikiArt. However, on that occasion the rescue was performed by the Tynemouth lifeboat, not that at Cullercoats, so Watching the Tempest may refer to a different incident. Each of these paintings carries its own simple story, but taken as a group they tell of the incessant routine of life in the fishing community: separation, watching, shore life paused in expectation, fear, worry, hopefully resolved in the safe return. I have fixed an earlier problem with enlarging one of the images above. My sincere apologies for this, which appears to have been the result of a server issue.